The final preparations are being made for our exhibition in York Minster. 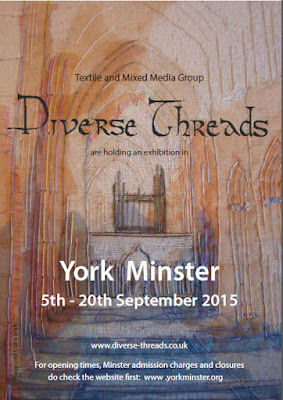 The exhibition features many new works, inspired by the Minster and its surroundings. Opening times and admission charges can be found by checking the Minster website here Do check before travelling, as the Minster is sometimes closed to the public when services are taking place. The exhibition is advertised on the Minster's 'What's On' pages here and runs until September 20th (even though the website makes it look as though we're only there for the day). The poster above shows work by Gina Smith - applied fabrics and hand embroidery - and is a detail of one of the pieces that will be featured in the exhibition.